The Galaxy M20 (review) has been launched by Samsung in order to compete against the various Chinese handsets that are dominating the budget smartphone segment. One among them is the Realme U1 (review), which looks to impress buyers with its high-resolution selfie camera and other admirable specs. The two phones are sitting in the same price bracket, but they are completely different from one another if you take a closer look at them. Wondering how so? 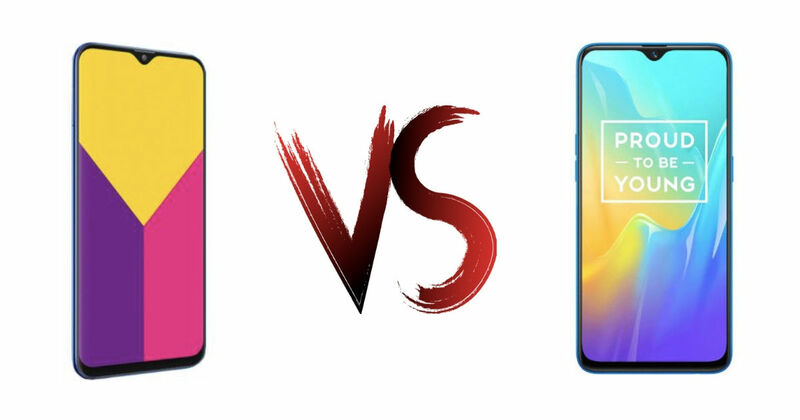 Read on to find out in a detailed comparison between the Samsung Galaxy M20 and Realme U1. The Samsung Galaxy M20 bears a polycarbonate rear shell with a glossy finish. The Realme U1 uses a plastic rear shell that features 13-layer laminated technology for making it look like glass. On the front of the Galaxy device is an Infinity V display, a name given by Samsung for its waterdrop notch-equipped panels. This means both the phones have cut-outs that allows them to offer full-screen fascias with minimal bezels. Other things common between the two include headphone sockets, dual rear cameras, fingerprint scanners on the back and 6.3-inch full HD+ displays. However, the M20 has a big advantage in the form of its USB Type-C connector that allows it to offer faster charging than the micro-USB standard present on the U1. The Galaxy device runs on the 14nm 1.8GHz octa-core Exynos 7904 processor made by Samsung. This assembly is assisted by a Mali-G71 MP2 GPU. Running the show on the Realme U1 is Mediatek’s Helio P70 SoC, which offers the benefits of a 2.1GHz octa-core processor and a Mali-G72 MP3 graphics unit. Both these phones ship with 3GB or 4GB RAM, which is paired with 32GB and 64GB of storage, respectively. Both these phones support microSD card slots as well. The Galaxy M20 runs the new Samsung Experience 9.5 UI, which is pretty different looking compared to the company’s One UI. It does not come with any bloatware other than some pre-installed Microsoft apps. The software is based on Android 8.1 Oreo, but there is a possibility of a Pie update being issued this August. The Realme U1 uses OPPO’s ColorOS 5.2, based on Android 8.1 Oreo. This software will be familiar to those who have used any Chinese ROM before. Its features include gesture navigation, a gaming mode, split-screen multitasking, facial unlock and others. The rear camera setup of the Samsung Galaxy M20 comprises a 13MP f/1.9 main snapper and an ultra wide-angle 5MP f/2.2 secondary snapper. This allows you to not only click ultra-wide shots, but also capture dense bokeh in your portraits. The front camera on this phone is an 8MP sensor. The Realme U1’s rear camera setup includes a 13MP f/2.2 main sensor and a 2MP f/2.4 depth sensor. A portrait mode is present here as well, apart from several AI based traits like portrait lighting and more. The front camera of the U1 is a whopping 25MP in resolution. Fuelling the new Samsung Galaxy M20 is a beefy 5,000mAh cell. It moreover, benefits from 15W fast charging support thanks to its USB Type-C port. The battery onboard the U1 is a 3,500mAh unit, which supports 10W fast charging. The Galaxy M20 is a solid proposition for people looking to buy affordable smartphones in the Indian market. The Realme U1 also has a great set of specifications, but it appeals more to the selfie-crazy audience. Add to it the fact that Samsung has kept the starting price as Rs 10,999 for its offering, and the M20 surely comes across as a better choice among the two if you want a great all-round smartphone with good cameras, excellent battery life, a good display and an admirable performance.